Irish swimmers Ellen Keane and Nicole Turner both swam lifetime bests in the morning heats of their respective 100m breaststroke at the Paralympic Swimming World Championships in Glasgow today to qualify for tonight’s finals. Thirteen year old Turner was first up in the sole heat of the 100m Breaststroke (SB6 class*) and showed no sign of fatigue after her fifth place in last night’s 400m Freestyle final. The Laois Marlins club swimmer knocked over four seconds off her previous best in this her preferred event of the six she is contesting this week. She finished fifth in a time of 1:48.24 securing a berth in her second World Championship final in the space of as many days. 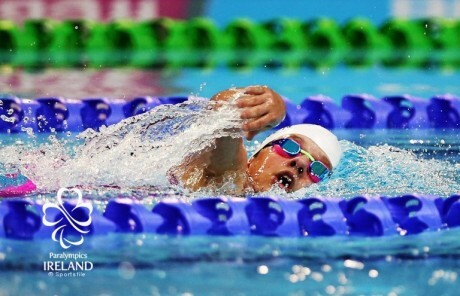 Keane was the second Irish swimmer racing this morning and also produced a lifetime best performance impressively winning the second heat of the 100m Breaststroke (SB8 class*) in 1:22.97; shaving two hundredths of a second off the previous time she set at the London 2012 Paralympic Games. Great Britain’s Clare Cashmore; reigning European Champion won the first heat in a time of 1:21.76 and double Paralympic champion Russian Olesia Vladykina looked very comfortable finishing behind Keane to book her spot in the final. This is Dubliner Keane’s leading event and she will be hopeful of challenging for a place on the podium after this morning’s heats. Keane also lined up in the heats of the 100m Freestyle (S9) this morning prior to the breaststroke heat. She finished in eighth place and did not advance to the final. These Championships are a key milestone on the road to Rio 2016 Paralympic Games qualification. Swimmers who win gold and silver in their events earn automatic qualification slots for their country. For the others the highest possible finish is vital as the remaining slots are allocated based on world rankings in 2016. The Irish team is proudly sponsored by Allianz; an official sponsor of Paralympics Ireland.